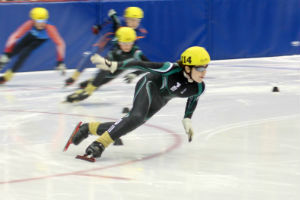 November 10th, 2015, Charlottetown – Island speed skaters took home fifteen medals from the Atlantic Cup Speed Skating Championships held over the weekend at the Eastlink Centre in Charlottetown. The home-ice medal haul included five gold medals and was tops in the competition, which featured skaters from five provinces as well as a contingent from Nunavut. 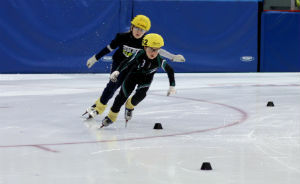 Anderson Arseneau (foreground, right) claimed one of five gold medals for PEI at the Atlantic Cup Speed Skating Championships held recently in Charlottetown. Photo courtesy of Kristen Binns. Taking gold medals for the host P.E.I. team were Jenna Larter (Division 5 female), William Lyons (Division 5 male), Carter Bruce (Division 6), Alex Rogers (Division 7) and Anderson Arseneau (Division 8). Lyons, of Rock Barra, won three of four distances for the overall win, while Larter’s strength in the sprint distances carried her to the top of the podium. Bruce, of Stratford, had a perfect first day and personal best times in all four distances to earn his gold. Rogers nabbed wins in three of four distances and Arseneau grabbed first in all four distances enroute to their overall wins. Andrew Binns set a pair of new provincial records for twelve year-old boys on his way to a silver medal in Division 4. Binns knocked time off Niall Burnett’s 2011 record in the 400 metre distance and from Kyle Connell’s 2014-15 mark in the 200m distance to launch the new season. Also earning silver medals for P.E.I. were rookie Jacob Theriault (Division 7), Julian Christie (Division 9 male), Holly Nickerson (Division 9 female) and Bill MacCannell in Masters. Andrew Binns (right) of Stratford won a silver medal and picked up a pair of provincial records at the Atlantic Cup Speed Skating Championships in Charlottetown. Photo courtesy of Kristen Binns. Earning bronze medals for the Island squad were Peter McQuaid (Division 1), Eliana Monthony (Division 4), Dakota Jager (Division 7), Zachary Chatfield (Division 8) and Olivia Wood (Division 9). McQuaid posted the fastest times among all Island skaters on the weekend and was joined in Division 1 by teammates Andrew McQuaid, Jared Vriends and Rob Binns. Binns posted a pair of new provincial records for Masters (40+) skaters, bettering his own previous marks in both the 500m and 1500m distances. Roger Fulton of Fredericton claimed the top spot overall in the meet, followed by Seamus Smith of the St. Croix Blades. Sarah Gilbert of Fredericton was the top female skater, followed by Bethany McKinley-Young of Halifax and Simone Hebert of Saint John. 119 skaters from 13 clubs participated in the meet, which featured 19 veterans of the 2015 Canada Winter Games. For full results and more information about Speed Skate PEI, visit www.speedskatepei.com.